Now what? It’s time to get serious. Getting a driving under the influence (DUI) conviction is not a good thing — and that’s an understatement. The offense will remain on your driving record for a long time if not forever. You may be wondering if it’s even possible to get car insurance and how to go about finding it at an affordable rate. One of the best ways to find better rates is by comparing quotes. You can do that right here by entering your zip code above. We’ll help you navigate the process and give you the information you need to find required car insurance at the best rate. Let’s start by giving you a heads up about how much you can expect your rates to increase after a DUI. – How much does a DUI raise your car insurance rates? – How long does a DUI affect car insurance? – What is an SR-22 requirement? – Commercial Drivers: Can you lose your CDL? – What’s the difference between a DUI and a DWI? Will insurance cover a DUI crash? – What car insurance options do I have if my spouse has a DUI? – How long will my insurance rates stay high following a DUI? – Can you get a DUI while parked? – How does a law enforcement officer determine if you’re driving under the influence? – Is reciting the alphabet backward part of the field sobriety test? – What happens if I have a DUI on my record and move to another state? – Can I get a DUI if my BAC is under the legal limit? – Can you get a DUI riding a bicycle? There will undoubtedly be an increase in your car insurance premiums after you have a DUI conviction. Insurance companies are all about managing risk. A DUI puts you at a greater risk for future claims, so you’re going to pay more. Nine percent of drivers involved in a fatal accident with a BAC over the legal limit of 0.08 percent had a previous DUI conviction. We’ve partnered with Quadrant Information Services to gather data related to DUI compared to other variables. 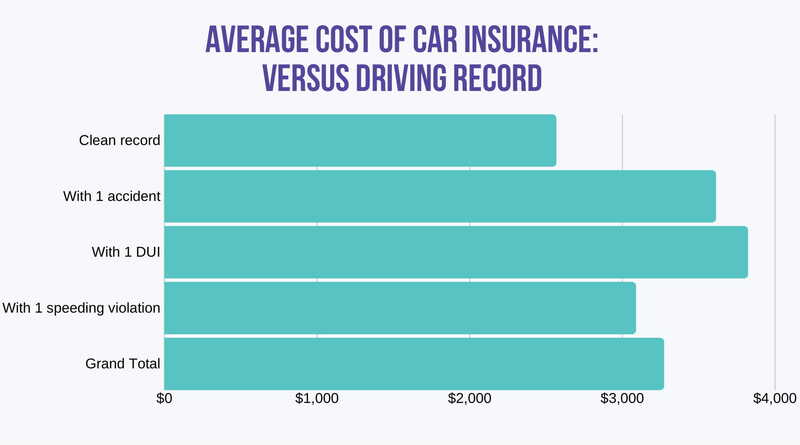 The best way to save on your car insurance is always to compare rates from multiple providers and make sure what you are comparing is apples to apple. This is never more important than after a DUI conviction when you’re sure to see your rates raise. Don’t assume the first or second you research will provide you with sufficient coverage and the cheapest rates after a DUI. More than ever, if you have a DUI it’s critical you compare rates from different providers to make sure you get the best protection you can afford. The answer here varies by state. Usually, the effect on insurance coincides with the look-back period in the state. Typically, car insurance rates are highest during the first three years after a DUI conviction. Years three through five post-DUI tend to see reduced car insurance rates. We’ve shown you some actual quotes to compare above, but your situation is going to be different, and the quotes you receive may vary greatly from the ones our sample people received. Comparing rate quotes for yourself is the best way to find the best rate. Right here on this page, we have a rate comparison tool that will allow you to receive many quotes at once without having to enter your information over and over at individual car insurance websites. An SR-22 is also called a certificate of financial responsibility. Depending on where you live, it may also be called an FR-44 or FR-19. When a person gets a DUI or commits another serious offense specified in state laws, they may be required to file a certificate of financial responsibility (SR-22, FR-44, FR-19). The SR-22 is not insurance. It is simply a form filed BY the insurance company WITH the state. The form must be filed with the state for the duration of your requirement. If the requirement is for three years, then the form will have to be filed for three years. An SR-22 form requires the insurance company who filed it to notify the state DMV if insurance coverage is dropped during the required period. You will know if you have to file a certificate of financial responsibility. If you receive a DUI conviction, the requirement will be part of your penalty. You may be able to stay with your current insurer if they are able and willing to file an SR-22. If not, you can choose a new provider who will. You can most certainly change insurance companies while you have an SR-22 filed, but you must have new insurance in place with SR-22 filing before canceling your previous coverage. All other states have a certificate of financial responsibility requirement. Typically, it’s required for three years, but it can vary between one and five years depending on the sate. The fee to file the form varies but is around $25. It’s possible that your car insurance coverage could be canceled following a DUI conviction. There are some states that do not allow insurance companies to drop customers because of a DUI, but most states allow it. And it is likely you will be dropped where it’s allowed. If that happens, you’re not without hope. There are likely other companies that will take on your higher risk. If you have one non-injury DUI on your record, you will likely not have too much of a problem finding insurance from a major company. However, if you have multiple DUIs, you might come to an impasse with conventional insurance companies. That’s where assigned risk pools come into play. Some drivers, however, have poor driving records and may not be able to obtain coverage because they present too much of a risk. Insurance regulators will require insurance companies to pool together and accept the assigned risk. Some states’ high-risk pools require you to try to get insurance the normal way from several companies and then after you’re denied, you can apply for the state’s assigned risk pool. You have to have car insurance to drive, and these pools are sometimes the only way high-risk drivers can fulfill these requirements. Implied consent means that by using the road, the driver is implying that he or she consents to chemical testing when lawfully arrested for a DUI. By refusing to be tested with a breathalyzer and/or a blood test, the motorist will face consequences similar to and maybe harsher than the penalty for a blood-or breath-confirmed DUI. Another law adopted by each and every state is the blood alcohol content (BAC) level limit. If your BAC level is 0.08 percent or higher, you can get a DUI. But keep in mind that even if your BAC is lower than that, you can still face a DUI conviction if impaired driving can be proven. Utah was the first state to adopt the 0.08 percent (from 1.0 percent) BAC limit in 1983, and they recently became the first state to set a new, lower, BAC limit of 0.05 percent, making it the strictest state in the U.S.
Underage drivers face zero-tolerance laws in all 50 states. Some states specify that an underage driver can be arrested for a DUI with any traceable level of alcohol in their blood, while others place the BAC limit at 0.02 percent. The Federal Motor Carrier Safety Administration (FMCSA) has established guidelines for commercial drivers that are stricter and carry heavier penalties than for non-commercial drivers. Most states have adopted stricter guidelines for commercial drivers. While the BAC limit for standard drivers is 0.08 percent, the limit for commercial drivers is typically 0.04 percent. A commercial driver who refuses a blood alcohol test essentially pleads guilty to a DUI under FMCSA rules. A DUI conviction while driving commercially can often result in tougher penalties than when driving for personal use. During the period of time the driver’s license is suspended after a DUI, he or she will obviously not be allowed to drive commercially. To sum it up, a DUI is not going to strip you of your CDL license, but license suspension penalties will apply, and securing work with a DUI on your record will be difficult. Another group that has a different set of limitation is minors. Check out the BAC limits for minors next. The limits for BAC are lower for those under 21, since consuming alcohol under that age is illegal. Also, younger drivers are still gaining experience, and driving even with a low BAC could have deadly results. Notice that you don’t always have to be “driving” to get a DUI. In many states, just being in “physical control” of the vehicle is enough for a DUI charge. Physical control could mean sitting in the car with keys in your pocket. Alabama Alabama Code § 32-5A-191: "Drive or be in actual physical control" BAC limit 0.02% or more"
"drive a motor vehicle when the person's BAC...is at least 0.02 but not more than 0.05 at the time of driving or within two hours after driving..."
"purchase, attempt to purchase, possess, or drink an alcoholic beverage in the District." "alcohol concentration of more than 0.00, may [lose their] privilege to operate a motor vehicle." "operate a vehicle...within this state if the person has any bodily alcohol content." There is really no difference. While there may be differences in the nuances of a drunk driving offense in California where it’s called a DUI and Ohio where it’s called an OVI, there are also differences between a drunk driving offense in New Jersey and South Dakota where they’re both called a DUI. Note: Colorado has a driving while ability impaired (DWAI) offense for BACs of 0.05 percent up to 0.08 percent. A BAC over 0.08 is called a “DUI per se.” A DUI in Colorado requires no blood alcohol test. Understand that there are variations between all the states, and the differences are not necessarily related to the name of the charge. The look-back period is the time frame in which a previous DUI will be considered. In Illinois, for example, that period is 10 years. If a person there got a DUI three years ago and then got arrested for a DUI again, it would be considered and penalized as a second offense. If an Illinois resident got a DUI 15 years ago and then is arrested for a DUI again, that offense will be penalized as a first offense. The look-back period is also known as the washout period. Depending on which state you live in, the criminal status of a DUI conviction varies. In most states, a first DUI is a misdemeanor, although it’s an infraction in some states and a felony in others. Typically, the DUI offense turns into a felony if it’s repeated several times. Check out these interesting state laws and penalties below. You really don’t want to get a DUI in Ohio! Below, we listed some variances that are unique to certain states. DUI – Driving under the influence of alcohol, drugs, or a combination of alcohol and drugs. No blood alcohol test is needed. DWAI – Driving while ability impaired by alcohol, drugs, or a combination of alcohol and drugs. BAC limit over 0.05 and under 0.08. DUI per se – Operating a vehicle with a BAC of 0.08 percent or more. Under Colorado law, drivers with five nanograms of active tetrahydrocannabinol (THC) in their blood can be prosecuted for driving under the influence (DUI). Law enforcement officers don’t have a breathalyzer-comparable device to test THC levels, so, often drug recognition experts (DREs) are called in to detect impairment level. In Ohio, all second and subsequent DUI offenders are required to use a bright yellow plate with red lettering. These “party plates,” also called, “scarlet letter plates” are required on every vehicle the offender intends to drive. Utah, as of December 30, 2018, has the lowest BAC limit for a DUI in the country at 0.05 percent. In most circumstances, an Anchorage police officer will give the offender an OUI charge, while State Troopers will issue DUI charges to everyone in the state, including in Anchorage. As with all things illegal, penalties accompany DUI convictions. There are tales of individuals, couples, and families being financially ruined because of the consequences of a DUI. You might think that fines are all the monetary loss you will experience following a DUI conviction, but have you considered the financial toll having your license suspended will bring? Add the extra transportation cost to the higher insurance premiums, and the financial impact is felt in a great way. The fines are just the tip of the iceberg. According to a survey administered by NOLO, a first DUI costs an average of $6,500. And likely that’s a low estimate because included in the survey were people whose charges were dropped or who won their case. Also, that $6,500 doesn’t take into account lost wages. This is one penalty that is a possibility, but likely won’t happen, especially with a first offense. You could be imprisoned for a first DUI, but it isn’t standard. Subsequent DUIs often carry a minimum jail sentence, in which case, you will definitely serve time. This penalty should be one of the greatest deterrents to drinking and driving. For most Americans, the ability to drive is vital for normal daily activities. You’ll have to rethink your errands, commute, and activities if you have your licenses suspended and can’t drive. Connecticut 45 days +1 year with IID 45 days +3 years with IID, first year limited to travel to and from work, school and substance abuse treatment program, IID service center or probation appointment license revoked, but eligible for reinstatement after two years. if reinstated, must only drive IID vehicle. This requirement may be lifted after 15 years by DMV commissioner. license revoked, but eligible for reinstatement after two years. if reinstated, must only drive IID vehicle. This requirement may be lifted after 15 years by DMV commissioner. Often, part of the penalty for a DUI conviction is education and assessment and/or treatment. The point of these required programs is to help the attendee not repeat the offense. All states have a requirement for an ignition interlock device (IID). Over half of the states in the US require their installation after the first drunk driving offense, while others offer incentives to those who install an IID, and others require IIDs after subsequent offenses. An IID is a breathalyzer that is designed for a vehicle. Before the vehicle can be started, the driver has to blow into the device. If the person’s alcohol level exceeds the prescribed limit, the vehicle will not start. Alabama Yes §32-5A-191 First offenders with .08 to .14 blood alcohol level must have an ignition interlock for a period of six months. If a first-time offender has a child of 14 years old or younger, has a BAC of 0.15 or higher, or causes an injury to another person, an ignition interlock device must be installed for 1 year, once their license has been returned to them. Second offenders have the same requirement, regardless of extenuating circumstances. A first time offender may also elect for an ignition interlock device for six months in lieu of the mandatory ninety-day license suspension. For third-time offenders the period is 3 years, and for fourth and subsequent offenses, the period is 5 years. 12.55.102 The Court shall require anyone who is convicted of DUI to equip any motor vehicle the person operates with an ignition interlock device after the person regains the driving privilege. Minimum of 6 months on first conviction, 12 months upon second conviction and 18 months for a third conviction. Criminal sanctions exist for circumventing or tampering devices. §28-3319(D)and(E) The court shall require any persons who are convicted of DUI to equip any motor vehicle the person operates with an ignition interlock device. The court shall also require offenders to equip vehicles operated with ignition interlock devices for 1 year at the conclusion of the license suspension/revocation period or on the date of conviction whichever is later if (1) a second drunk driving offense occurs within 84 months; (2) a third or subsequent drunk-driving offense (aggravated driving under the influence ); (3) a drunk-driving offense where the offender is driving on a suspended or revoked license for a prior DWI offense or a prior admin. per se violation (AGDWI); (4) a first or second BAC of 0.15 offense; or, (5) a drunk-driving child endangerment offense. Offenders are eligible for an ignition interlock after 45 days of their license suspension if they wish to resume driving more quickly. For offenders who were convicted of driving with a BAC of 0.15 to 0.2, a judge may suspend all but 9 days of their jail time if they install an ignition interlock device. For drivers convicted of driving with a BAC greater than 0.2, a judge may suspend all but 14 days of their jail sentence if they install an interlock device. §5-65-118 A person arrested for a first offense DWI are not entitled to a restricted permit but are allowed an ignition interlock restricted license. In addition to any other sanction for a DWI offense, the court (1) must for a first, second, third or subsequent offense, if the offender can afford it, require only operating a motor vehicle equipped with an ignition interlock device. This requirement continues for up to 1 year after the person's license is no longer suspended or revoked. If restricted licenses have been issued, the required use of an ignition interlock device “shall be for at least the remaining time period of the original suspension” period. Persons arrested for operating a motor vehicle while intoxicated by the use of a controlled substance or refusal to submit to testing are ineligible for an ignition interlock restricted driving permit. California No Vehicle Code §§ 14601.2, 23556,Vehicle Code §§13352(a) and 23575(f)(1) The court may require that a person convicted of a first DUI offense install a certified ignition interlock device on any vehicle that the person owns or operates and prohibit that person from operating a motor vehicle unless that vehicle is equipped with a functioning, certified ignition interlock device. The court shall give heightened consideration to applying this sanction to a first offense violator with BAC of 0.15 percent or more, or with two or more prior moving traffic violations, or to persons who refused the chemical tests at arrest. If the court orders the ignition interlock device restriction, the term shall be determined by the court for a period not to exceed 3 years from the date of conviction. §42-2-132.5(1.5) For a first offense, offender's license will be revoked for 9 months, with the option after 1 month, to install an ignition interlock device and receive a limited license. A person with greater than BAC of 0.17 is classified as a “persistent drunk driver” and must use an ignition interlock for at least 1 year. For either (1) an impaired, under the influence or illegal per se offense or (2) a habitual offender offense related to one of these alcohol offenses where there has been a previous alcohol driving offense conviction of any type within a 5-year period, an offender must install ignition interlock devices on the vehicles that person drives and is required to hold a restricted license for at least 1 year prior to full license reinstatement. §53a-56b Any person who has been arrested for a violation may be ordered by the court not to operate any motor vehicle unless such motor vehicle is equipped with an ignition interlock device. The Commissioner of Motor Vehicles shall permit a person whose license has been suspended to operate a motor vehicle if such person has served not less than 45 days of such suspension, and such person has installed an approved ignition interlock device in each motor vehicle owned or to be operated by such person. For a first DUI offense, the driver is prohibited from operating the vehicle for 1 year, after the 45 day suspension period, without the ignition interlock device. For a second offense within 10 years, the driver may not operate a vehicle for 3 years, after the 45 day suspension period, without an approved ignition interlock device. 21 §4177G All persons convicted of an offense must participate in the Ignition Interlock Device Program. If the original revocation was for 12 months, a person must agree to participate in the program for 14 months whereupon a conditional license is available after 1 month. If the original revocation was for 12 months where there are no prior offenses but there is a refusal to submit to a chemical test, a person must agree to participate in the program for 14 months whereupon a conditional license is available after 2 months. If the original revocation was for 18 months, a person must agree to participate in the program for 20 months whereupon a conditional license is available after 6 months. (3) Upon a third or subsequent conviction, a period of 2 years. §322.271(2)(d) Use of ignition interlock device is mandatory for at least 1 year upon a second conviction if driver qualifies for a permanent or restricted license and for at least 2 years for any third conviction and for other extenuating circumstances. If a first-time DUI offender was accompanied in the vehicle by a person younger than 18 years of age, the person shall have the ignition interlock device installed for 6 months for the first offense and for at least 2 years for a second offense. A DWI defendant who is placed on probation and who is otherwise permitted to operate a motor vehicle shall be required to operate vehicles equipped with ignition interlock devices for not less than 6 months. In addition, the licensing agency may require any person seeking reinstatement of their driving privileges to use an ignition interlock device on their vehicle. This requirement can apply to either occupational restricted or regular driving privileges. §40-5-64(c.1)(2) Georgia law allows for first offenders to use an ignition interlock. Second and subsequent offenders on probation must install ignition interlock devices on all of the vehicles they own and only operate vehicles equipped with such devices. Use begins when the offender is issued limited driving privileges and must last for at least 12 months. If habitual offender status is based on two or more drunk-driving offense convictions and the offender is placed on probation, the use of a probationary license is conditioned of the use of an ignition interlock device for 6 months after the probationary license has been issued. An ignition interlock device limited driving permit shall be restricted to allow the holder thereof to drive solely; to work, to school, regularly scheduled sessions or meetings of treatment support organizations, and monthly monitoring visits with the permit holder's ignition interlock device service provider. If a court grants an exemption from the ignition interlock device requirements, such person shall not be eligible for a limited driving permit or any other driving privilege for a period of one year. Guam – – No laws available at this time. Hawaii Yes 2008 H.B. 3377 For first offense: 1-year revocation of license and privilege to operate a vehicle during the revocation period and installation during the revocation period of an ignition interlock device on any vehicle operated by the person. For second offense within 5 years or first conviction if Highly Intoxicated: A 2-year revocation of license and privilege to operate a vehicle during the revocation period and installation during the revocation period of an ignition interlock device on any vehicle operated by the person. §18-8005(4)(f) and (5)(e) If a person is convicted, is found guilty or pleads guilty to violating provisions relating to driving under the influence, the court shall order the person to have a state approved ignition interlock system installed at his expense, on all motor vehicles operated by him. Ignition interlock installation is mandatory following the mandatory license suspension period for violators who had BAC over 0.20 at time of arrest. Any person who has been found guilty of DUI within the prior 10 years, installation of an ignition interlock is mandatory. Illinois Yes 625 ILCS 5/11-501.01 The court shall require any persons who are convicted of DUI to equip any motor vehicle the person operates with an ignition interlock device during the period of statutory license suspension. Other than offenders that must drive to and from a farm, or operate a tractor while working on a farm, DUI offenders will be automatically issued an ignition interlock device. They may decline the device, but without it, the offender will face increased penalties. 9-30-5-16IC 9-30-5-10(c)-(d) As a condition for obtaining probationary driving privileges, the court may require a defendant to use only vehicles equipped with ignition interlock devices for a term established by the court with the limitation that such term cannot exceed the maximum prison sentence; violation of this requirement is a Class A infraction. Other provisions of law also provide that a person convicted of an illegal per se/intoxicated offense (within 5 years or within 10 years but more than 5 years of a previous conviction) may be granted probationary (restricted) driving privileges on the condition that the person only operates vehicles equipped with ignition interlock devices. and 321J.4§§321J.9(2)(b) and 321J.20(6) A defendant whose alcohol concentration is .08 but not more than .10 shall not be eligible for any temporary restricted license for at least thirty days if a test was obtained and an accident resulting in injury or property damage occurred. The department shall require the defendant to install an ignition interlock device on all vehicles if the defendant seeks a temporary restricted license. A defendant whose alcohol concentration is more than .10 shall not be eligible for any temporary restricted license for at least thirty days if a test was obtained and an accident resulting in injury or property damage occurred or the defendant’s alcohol concentration exceeded .15. The department shall require the defendant to install an ignition interlock device on all vehicles if the defendant seeks a temporary restricted license. A second or subsequent offender, after the mandatory license revocation period, may be granted restricted driving privileges provided they install ignition interlock devices on all of the vehicles they own.Prior to reinstating the driving privileges to a second or subsequent offender, the State shall require such person to install ignition interlock devices on all of the vehicles they own for 1 year. For either a first or subsequent refusal, a restricted license may be issued by the licensing agency provided the minimum period of license revocation has expired. A person must install an ignition interlock system on the vehicle(s) they operate as a condition for obtaining a restricted license. A person who tampers with or circumvents an ignition interlock device installed as required in this chapter and while the requirement for the ignition interlock device is in effect commits a serious misdemeanor. §§8-292 and 8-1015 First offense, BAC over 0.08: a 30-day suspension followed by 6 months of ignition interlock device if your record is clear OR 12 months of interlock if you have a prior open container violation or three or more moving violations. Failure of a breath test with a result of BAC over 0.15 the first time, or over 0.08 on a second or subsequent occurrence is a 1 year suspension followed by ignition interlock (length of interlock is dependent on priors). Refusal of a breath, blood or urine test is a 1-year suspension, followed by ignition interlock requirement (length of interlock is dependent on priors), regardless of how many prior Kansas DUI occurrences a person has. Those that are required to install ignition interlocks for 10 years may petition the court after 5 years to have it removed. Driver with an ignition interlock can drive vehicle only for the purposes of getting to and from: Work, school or an alcohol treatment program; and the ignition interlock provider for maintenance and downloading of data from the device. Tampering or circumventing the ignition interlock device is a class A, nonperson misdemeanor: first conviction, restriction extended 90 days; second or subsequent conviction, restart the original restriction period. Kentucky No §189A.340§189A.410 At the conclusion of an offender’s license revocation period, the court may require that person to operate only motor vehicles equipped with ignition interlock devices (with the exception of an employer’s vehicles). This requirement lasts for the following periods following license revocation: first offense – 6 months; second offense (within 5 years) – 12 months; third or subsequent offense (within 5 years) – 30 months. Second or subsequent offenders must wait at least 1 year from the start of the license revocation period before applying to the court for permission to use an ignition interlock device. This requirement may be used as an alternative to impounding the license plates of a second or subsequent drunk-driving offender. The court may grant hardship driving privileges for the purpose of employment, education, medical care, alcohol/substance abuse education programs or other court-ordered counseling programs. This privilege may be conditioned on the offender operating motor vehicles equipped with ignition interlock devices. §14:98K(1) For the offense, upon first or second conviction, or entry of a plea of guilty or nolo contendere, the offender’s vehicle must be equipped with a functioning ignition interlock device to be issued a restricted license. First offense with a BAC of 0.20 or more results in suspension for at least 2 years. But a restricted license may be granted during the entire period of suspension with installation of ignition interlock. 29-A §2508 As a condition of license reinstatement the Secretary of State may require a person to install in the motor vehicle the person operates for a period of up to 2 years an ignition interlock device. The license of a person with one OUI offense may be reinstated after 30 days of the suspension period has run if the person has installed for a period of 150 days or the length of time remaining for an ignition interlock device approved by the Secretary of State in the motor vehicle the person operates. The license of a person with 2 OUI offenses, convictions or adjudications may be reinstated after 2 years if the person installs for a period of 9 months an ignition interlock device approved by the Secretary of State in the motor vehicle the person operates. The license of a person with 3 OUI offenses, convictions or adjudications may be reinstated after 3 years if the person installs for a period of 3 years an ignition interlock device. The license of a person with 4 or more OUI offenses, convictions or adjudications may be reinstated after 4 years if the person installs for a period of 4 years an ignition interlock device approved by the Secretary of State in the motor vehicle the person operates. Tran. §16-404.1(b)(4)(iii) As a condition of probation, the court may order a defendant for 1-3 years to operate only vehicles equipped with ignition interlock devices. If defendant registers a BAC of 0.15 or more, the court must order ignition interlock for at least 1 year. The licensing agency may establish an ignition interlock program for persons who have been convicted of alcohol-related driving offenses. This program does not apply to persons who have been convicted of driving while under the influence of a controlled substance. A person who is subject to license suspension via the point system for a conviction of DWI may be issued a restricted license by participating in the Ignition Interlock Program. A person who is subject to license revocation following a conviction for either DWI or for DUI may have the license suspended in lieu of revocation by participating in the ignition interlock program. The suspension periods (or restricted license) imposed are the same as for DWI. A fourth or subsequent offender is considered a “habitual offender” and he cannot have his driving privileges restored until he has participated in this program for at least 24 months. Massachusetts No 90§24 (1)(c)(2) Offenders with more than one drunken-driving conviction are required to install an ignition interlock device on their vehicles for a period of 2 years as a condition of having their licenses reinstated. §257.625 (24) A person who has had his license revoked for any drunk-driving offense may, after the mandatory revocation period, be issued a restricted license instead of full driving privileges. If a restricted license is issued, the driver is limited to operating motor vehicles that are equipped with an ignition interlock device. The initial period for the use of such device is 1 year. Interlocks required for first-time DUI offenders convicted with a BAC of 0.17 or above. Minnesota No §171.306§169A.275 (7) A judge is not required to sentence a person as provided in this section if the judge requires the person as a condition of probation to drive only motor vehicles equipped with an ignition interlock device meeting the standards described in section 171.306. First offenders may apply for conditional reinstatement of the driver's license, subject to the ignition interlock restriction. Second or subsequent offenders may apply for a limited license, subject to the ignition interlock restriction, if the program participant is enrolled in a licensed chemical dependency treatment or rehabilitation program as recommended in a chemical use assessment, and if the participant meets the other applicable requirements of section 171.30. Tampering or attempting to circumvent the interlock system: 180 days for a first violation; 1 year for a second violation; or 545 days for a third and each subsequent violation. Exemption: Employer. Exception not allowed for violations causing bodily harm. §63-11-31(2) For the first offense, the offender will have license suspended for 90 days and until such person attends and successfully completes an alcohol safety education program. However, in the court’s discretion, the license may be suspended for 30 days and the offender must operate a vehicle under an ignition interlock restricted license for 90 days following the mandatory thirty-day suspension. Upon a second offense, the license shall be suspended for a period of 45 days. The offenders license will not be restored following the mandatory suspension, unless, the person holds an ignition interlock restricted license for one year. Upon a third offense, the license will be suspended for a mandatory two years. Following the 2 years, offenders will not be eligible to drive unless they hold an ignition interlock restricted license for 3 years following the release of incarceration. Missouri No V.A.M.S. 302.304V.A.M.S. 577.600 When a license is suspended or revoked ignition interlock is required to be maintained on all motor vehicles operated by the person for a period of not less than 6 months immediately following the date of reinstatement. A court may require that any person who is found guilty of or pleads guilty to a first intoxication-related traffic offense, and a court shall require that any person who is found guilty of or pleads guilty to a second or subsequent intoxication-related traffic offense, shall not operate any motor vehicle unless that vehicle is equipped with a functioning, certified ignition interlock device for a period of not less than 6 months from the date of reinstatement of the person's driver's license. §61-8-442 For a first offense, a court may restrict an offender to only operate motor vehicles that are equipped with ignition interlock devices. For either a second or subsequent offense, a defendant who is issued a probationary license is restricted to operating motor vehicles that are equipped with ignition interlock devices. For fourth or subsequent offenses, if an offender is permitted to operate motor vehicles as a condition of probation, such vehicles must be equipped with ignition interlock devices. Licensing action is stayed while participating in the ignition interlock program. The duration of this restriction is equal to the period of license suspension or revocation. §60-498.01(10) and (11) At the expiration of 30 days (60 days if test refused) after an order of administrative license revocation for 90 days is entered, any person who submitted to a chemical test which disclosed the presence of a concentration of alcohol in violation of the statutory limit is eligible for an order to allow application for an ignition interlock permit to operate a motor vehicle equipped with an ignition interlock device upon presentation of sufficient evidence to the Department of Motor Vehicles that such a device is installed. As an alternative to vehicle disablement, the court shall order the convicted person, in order to operate a motor vehicle, to obtain an ignition interlock permit and install an ignition interlock device on each of the motor vehicles owned or operated by the convicted person if he or she was sentenced to an operator's license revocation of at least 1 year and has completed at least 1 year of such revocation. Those without prior records may operate their ignition interlock equipped vehicle only to work, school, a substance abuse treatment center, a parole meeting, to a healthcare facility, or to community service. Those with a record may only drive to school, work, or to a treatment facility. Persons under 18 years of age shall not be eligible for an ignition interlock permit. Tampering or attempting to circumvent the interlock shall, in addition to any possible criminal charges, have his or her revocation period and ignition interlock permit extended for 6 months beyond the end of the original revocation period. Nevada Yes §484.3943(1) and (2) The court shall require a defendant to install an ignition interlock as a condition for restricted driving privileges as follows: First offense – minimum of 6 months (mandatory) with a BAC less than 0.18, 12-36 months (mandatory) if over 0.18; second offense – (mandatory); and, third and subsequent offense – 12 to 36 months (mandatory). The court may require a defendant to install an ignition interlock as a condition for the reinstatement of driving privileges. The period of use is determined by the court. Exemptions: Financial hardship, employer, medical, unable to provide lung test and/or defendant lives more than 100 miles from a manufacturer of a device or agent. New Hampshire Yes §265-A:36 Interlock device required on any vehicle registered to a person who drives after a suspension or revocation resulting from a DWI offense. §39:4-50.17 A first time offender with a BAC greater than 0.15 must install an ignition interlock device. Installation is mandatory for 6 months after the required period of license suspension has been served. After license suspension period has been completed, a person may be required to install an ignition interlock device on all of the motor vehicles he owns or operates. The device must be installed for the following periods: first offense—discretionary 6 months to 1 year (6 months required usage if ignition interlock use ordered); second or subsequent offense—mandatory ignition usage for 1 (mandatory) to 3 years. a period of 1 year, for a first offender; a period of 2 years, for a second conviction; a period of 3 years, for a third conviction; for life for a fourth or subsequent conviction, except that 5 years from the date of conviction and every 5 years thereafter, the offender may apply to a district court for removal of the Interlock for good cause shown. Good cause may include alcohol screening and proof from the interlock vendor that the person has not had violations of the interlock device. VT §1193(1-a)(c) Ignition interlock is required for all offenses during the period of license revocation or a minimum of 6 months and thereafter by court order. §20-17.8(c) Persons eligible for restricted driving privileges may be required to operate motor vehicles equipped with an ignition interlock device. This requirement is mandatory if the BAC was greater than 0.16 or if the person is a second or subsequent offender (within 7 years). After license restoration, required ignition interlock usage is as follows: 1 year if license revocation was for 1 year; 3 years if license revocation was for 4 years; and 7 years if the license was permanently revoked but can be restored. Tampering or attempting to circumvent the interlock system is a Class 1 misdemeanor. §39-08-01.3 The court or driver licensing agency may order a defendant to install an ignition interlock device on his vehicle. This requirement applies to the issuance of temporary restricted driving privileges. §2951.02(G)(2) and (3) If imposed, as a condition of probation by the court, offenders must obtain a specially marked driver’s license indicating they may only operate a vehicle equipped with such an ignition interlock device. For first and second offenses, the court may order a person to use ignition interlock devices when using an occupational license; for third and subsequent offenses, the court must require a person to use these devices when using an occupational license. Oklahoma No 47 §11-902 (D).47§§ 754.1(B) and 755. §6-212.3 A person is guilty of Aggravated Driving if convicted of driving under the influence with a BAC greater than 0.15. Such a conviction, or a refusal to take a chemical test, requires ignition interlock use for a minimum of 30 days. After a period of license revocation, as a condition of modification, the driver must agree, except in certain circumstances, to only operate motor vehicles that are equipped with an ignition interlock device. The motor vehicles department will issue a new driver’s license with the words “Interlock Required” on it. For a first time offender, with a BAC greater than 0.15, or chemical test refusal, once their initial license revocation period is finished, they will be required to have an ignition interlock device for 1.5 years, or until their driving privileges would normally be reinstated, whichever is longer. For a second time offender, the interlock period is 4 years, or until driving privileges are to be reinstated, whichever is longer. For a third or subsequent offense, the period is 5 years or until their license would be normally reinstated, whichever is longer. §813.602 Persons convicted of DWI offenses shall have an ignition interlock device installed in their vehicles prior to being issued a hardship license. First offenders must operate motor vehicles equipped with ignition interlock devices for 1 year after the end of the license suspension or revocation period; second or subsequent offenders must operate with an interlock device for 2 years after the ending date of the suspension or revocation caused by the conviction. The court may require the use of an ignition interlock device as part of a diversion agreement. Pennsylvania Yes 75 §3805(a) All vehicles owned by offenders may for a first offense and must for a subsequent one be equipped with ignition interlock devices for at least 1 year following license reinstatement. Puerto Rico – – No laws available at this time. § 31-27-2 Beginning January 1, 2015, convicted DUI offenders with a blood alcohol content at 0.15 or above, repeat DUI offenders and offenders who repeatedly refuse BAC tests must install ignition interlock devices. Third or subsequent offender may be required to use these devices for 2 years. Requirements begin following the completion of any incarceration period. Exemptions: Employer. (ii) Every person convicted of a first violation whose blood alcohol concentration is one-tenth of one percent (.1%) by weight or above, but less than fifteen hundreths of one percent (.15%), or whose blood alcohol concentration is unknown, shall be subject to a fine of not less than one hundred ($100) dollars, nor more than four hundred dollars ($400), and shall be required to perform ten (10) to sixty (60) hours of public community resitution and /or shall be imprisoned for up to one year. The sentence may be served in any unit of the adult correctional institutions in the discretion of the sentencing judge. The person's driving license shall be suspended for a period of three (3) months to twelve (12) months. The sentencing judge shall require attendance at a special course on driving while intoxicated or under the influence of a controlled substance and/or alcoholic or drug treatment for the individual; provided, however, that the court may permit a servicemember or veteran to complete any court-approved counseling program administered or approved by the Veterans' Administration. The sentencing judge or magistrate may prohibit that person from operating a motor vehicle that is not equipped with an ignition interlock system as provided in § 31-27-2.8. South Carolina No §56-5-2941 The Department of Motor Vehicles must require the person, if a subsequent offender, to install an ignition interlock device. The DMV may waive the requirements of this section if it finds that the offender has a medical condition that makes him incapable of properly operating the installed device. The length of time that an interlock device is required to be affixed to a motor vehicle following the completion of a period of license suspension imposed on the offender is 2 years for a second offense, 3 years for a third offense, and the remainder of the offender's life for a fourth or subsequent offense. Notwithstanding the pleadings, for purposes of a second or a subsequent offense, the specified length of time that an interlock device is required to be affixed to a motor vehicle is based on the Department of Motor Vehicle's records for offenses. Exemptions: Financial hardship, medical, employer. South Dakota No § 1-11-24 The Attorney General, may promulgate rules for the administration of and provide for procedures and apparatus for testing including electronic monitoring devices and ignition interlock devices. (4) Is in violation of the implied consent law, and has a conviction or juvenile delinquency adjudication for a violation that occurred within five years of the instant implied consent violation, for implied consent, underage driving while impaired, the open container law, or reckless driving if the charged offense was DUI. (4) Fourth or subsequent offense: eight years. If a person convicted of a DUI has a prior DUI conviction within the past five years, then, after the revocation period, the person may only operate only a motor vehicle that is equipped with a functioning interlock device for one year and such requirement is a condition of the person's probation. For a second DUI violation within ten years, the installation of an ignition interlock device is mandatory. No geographic restriction requirements for restricted licenses. 42.12 For a first or subsequent offense: The court must order the offender to install ignition interlock devices on all of the motor vehicles he owns for the period of license suspension. The offender can choose a hard suspension with no interlock. When applying for an occupational license, the court may require a first offender and must require subsequent offenders within 10 years to only operate vehicles that are equipped with ignition interlock devices. Unless the interests of justice indicate otherwise, a magistrate shall require an offender (Intoxicated Assault, Intoxicated Manslaughter or a subsequent DWI offense), after release from confinement, to only operate vehicles that are equipped with ignition interlock devices. §41-6-44(15) An offender is required, as a condition of probation, only to operate motor vehicles that are equipped with ignition interlock devices. The person’s license will be suspended pending completion of the period with the interlock device. If the defendant had a BAC of 0.16 or higher, the court shall order the following (or describe on record why the order or orders are not appropriate): Treatment and one or both of the following: ignition interlock system as a condition of probation, and home confinement through the use of electronic monitoring. (iii) one year for a third or subsequent offense. Persons who elect to obtain an ignition interlock RDL following a conviction under this subchapter when the person's BAC is 0.16 or more shall be required to install an ignition interlock device with a Global Positioning System feature. Second or subsequent offenders must install an ignition interlock device for 18 months before a driver's license will be reinstated. Tampering or attempting to circumvent the interlock is a criminal offense and if convicted the period of use is extended by 6 months. §46.2-391 For first offense and subsequent offenses, the court shall require a DWI offender who has been granted either restricted driving privileges or full driving privileges on condition to operate only motor vehicles that are equipped with ignition interlock devices for any period of time not to exceed the period of license suspension and restriction, not less than 6 consecutive months without alcohol-related violations of the interlock requirements. Tampering or attempting to circumvent an interlock is a Class 1 misdemeanor. §46.20.385 The court shall order any person convicted of an alcohol-related violation or an equivalent local ordinance to apply for an ignition interlock driver's license and to have a functioning ignition interlock device installed on all motor vehicles operated by the person. The court may also order the installation of an interlock device for a driver that is convicted of reckless or negligent driving within 7 years of an alcohol-related driving offense. An ignition interlock may be required for reckless or negligent drivers without a prior DUI conviction. An ignition interlock device will be required for any driver convicted of vehicular homicide while driving under the influence. If a minor passenger was in the vehicle at the time of the DUI offense, the use of an ignition interlock device is extended by six months. The court may waive the requirement that a person obtain an ignition interlock driver's license and operate only vehicles equipped with a functioning ignition interlock device if the court makes a specific finding in writing that the devices are not reasonably available in the local area, that the person does not operate a vehicle, or the person is not eligible to receive an ignition interlock driver's license. For a person who has not previously been restricted, the device shall be installed for a period of 1 year; for a second restriction, a period of 5 years; for a third or subsequent restriction, a period of 10 years. The driver may apply for day-for-day credit towards the period of license revocation for use of an interlock device, as long as the device is installed in all non-exempt vehicles the driver operates. A person receiving an ignition interlock driver's license waives his or her right to a hearing or appeal under RCW 46.20.308. If a minor passenger was in the vehicle at the time of the DUI offense, the use of an ignition interlock device is extended by six months. West Virginia Yes 17C-5A-3a An individual convicted of driving under the influence must participate in the State’s Alcohol Test and Lock Program (ATLP). Part of the ATLP is use of an ignition interlock device (IID). Within sixty (60) days of installing an IID through a state-approved service provider, individuals must enroll in the ATLP. An IID must be installed on all vehicles owned or operated by the offender. (1) First time offender with a BAC between .08 and .15: at least one hundred and twenty-five days. (2) First offense for refusing a test: at least one year. (3)First offense with a BAC (4) First offense resulting in the death of another person: at least two years. (5) First offense resulting in serious bodily harm to another person: at least one year. (6) First offense with a minor in the vehicle: at least ten months. Subsequent admin per se violation or DWI offense and second or subsequent refusal: The ignition interlock must be used for 2 years. 343.305(10m) For a second or subsequent offense (within 5 years), a person’s vehicles must be immobilized or equipped with an ignition interlock device for not less than 1 year nor more than the maximum period of license revocation. Ignition interlock usage starts 1 year after the revocation period. The DOT must limit the occupational license of a person who has 2 or more prior violations to operating only vehicles equipped with an ignition interlock device, regardless of whether a court has ordered every vehicle that is titled or registered in the offender's name to be equipped with such a device. Interlocks mandatory for a minimum of 1 year if the person has a BAC of 0.15 or more. For a fourth or subsequent conviction, operate only vehicles equipped with an ignition interlock device, for the remainder of the offender's life, except 5 years from the date of conviction and every 5 years thereafter, the offender may apply to the court for removal of the ignition interlock device required by this paragraph. The court may, for good cause shown, remove the ignition interlock device requirement if the offender has not been subsequently convicted of driving a motor vehicle in violation of this section or other law prohibiting driving while under the influence. If a person fails to submit to all required chemical tests requested by the peace officer shall result in the suspension of his Wyoming driver's license or his privilege to operate a motor vehicle for a period of 6 months for a first offense or 18 months for a second or subsequent offense and he may be required to drive only vehicles equipped with an ignition interlock device. Many states have higher penalties for persons caught driving with a BAC over 0.15 percent. The stiffer consequences are for good reason. Over 50 percent more drivers involved in fatal crashes had a BAC level of 0.16 percent than those with a BAC of 0.08 percent. Insurance companies will often increase rates by a higher percentage for those convicted of a high BAC DUI than those convicted of a standard DUI. Below are the high BAC limits by state. Some states have more than one tier of high BAC offense. High BAC is strongly related to the fatality rate when driving. See just how strong the correlation is next. On the map above, you can see the percentage of DUI-related traffic deaths out of all traffic deaths. A BAC level of 0.08 percent makes you 250 percent more likely to be involved in an accident than someone with no alcohol in his or her blood. And when you have a BAC level of 0.16 or higher, you’re looking at an over 1100 percent increased chance of being in an accident. Let those stats serve as education. Don’t drink and drive. Your life is worth finding a ride. “Each day, people drive drunk more than 300,000 times, but only about 2800 are arrested,” according to Mothers Against Drunk Driving (MADD). Obviously, there are many times more people drinking and driving than are getting caught. You would think that in states where DUIs are being pounded by law enforcement, you’d see less drunk driving and fewer fatalities, but as you can see by this chart, they don’t seem to correlate, in fact, the three states with the highest arrest rate are in the top seven states for death rates. There is a little more correlation between the death rate and the rate at which people admit to drinking and driving, though it’s still certainly not a magic formula. The states that have the highest fatality rate tend to be less populated states with many miles of roadway. You’ll certainly have more of a chance to cause a fatality when traveling at highway speeds than you would while traveling in town. There are more arrests made in the states where people admit to drinking and driving at higher rates. Also in the states at the top of the list vs the states at the bottom of the list, there is a big difference in access to public transportation. New York City runs on public transportation and taxis. Montana doesn’t; in most small towns, you’d be hard pressed to even find an Uber driver. Another factor is that in metropolitan areas, people tend to frequent their local tavern, which is close and maybe even accessible by foot. In states like Montana and Wyoming, metropolitan areas are few and far between, and it’s almost a cultural part of life to drive home drunk, often covering many miles. If you have caused a DUI crash or even just been involved in one, you’re going to want to read on to learn if insurance will cover that crash. This topic is tricky. The insurance company may cover your liability after you cause a DUI crash. But, it may not. Determining which insurance company pays for the damages caused by the accident depends on which driver was at fault and your state’s particular insurance laws. If you were found to be under the influence of drugs or alcohol at the time of the accident, you will most likely be considered the cause of the auto accident. Some states have a no-fault system. In a no-fault state, each driver must file a claim with their car insurance provider for personal injury claims and the individual’s insurance company pays for those expenses. However, living in a no-fault state does not entirely preclude you from being sued. Usually, those exceptions state that you can be sued if you cause grievous bodily harm to another individual, and you were obviously the driver that caused the accident. When the state does not have no-fault laws, the insurance companies must determine who caused the accident because that driver’s insurance company will be responsible for paying for damages and injuries that were caused by the accident. If you are determined to be the driver that caused the auto accident, because your blood alcohol levels were higher than legally allowed, your insurance company may or may not pay your expenses. It depends on your specific insurance policy and the policies of your insurance company. They may argue that drunk driving was an “intentional act” and thus deny coverage. If your insurance company denies coverage for the damage you cause another party, you will be responsible for paying those damages out of pocket. Keep reading to find some great tips to find lower rates! Not every car insurance company will insure you if you have been convicted of a DUI or DWI as this makes you a high-risk driver. If you find a car insurance company that is willing to insure you once your driver’s license is in good standing, you will have to pay an enormous premium. By shopping around for different DUI car insurance, you may be able to find lower rates. One of the best things you can do is complete a drunk driving rehabilitation course, even if the law does not require it of you. Completing a course like that can help lower your car insurance premium if you are convicted of drunk driving. Finding lower rates can start right here! Enter your zip code into our rate tool below and start comparing quotes. Below, we have answered some of the most popular questions concerning DUIs. Get car insurance that excludes the driver with the DUI/DWI conviction. Get coverage that includes that driver and try to get the best deal possible on the premium. Likely, your insurance rates will drop as the years since your infraction grow and the insurance company will likely not consider your offense at all once you reach your state’s washout period. This answer depends on the state laws where you live. Some laws specify that it is illegal for a person to “drive” under the influence of alcohol, so if that’s what your laws state, you’d actually have to be driving. Most states add to the driving requirement and say “being in physical control” of the vehicle, which sitting in the driver’s seat with the keys in the ignition would constitute. In a lot of places, the keys don’t even have to be in the ignition, just in the driver’s possession. The officer will most likely pull you over because you have disobeyed a traffic law. He will then use his senses to gather information like the smell of alcohol, hearing slurred speech, etc. If his or her suspicions warrant further investigation, he or she may ask you to take a field sobriety test. Based on the results of the maneuvers test, you may be asked to blow into a breathalyzer. No. Can you even do that when you’re sober? It depends on which state you got a DUI in and what state you’re moving to. Many states have shared databases, which means your DUI offense will move with you. California will evaluate the DUI conviction and decide if it falls under their DUI laws. Actually, in a lot of places you can. It’s a harder offense to prosecute, but if the officers can prove impairment, you may still be faced with a DUI even if your BAC is under 0.08 percent.